If you could bottle days, Wednesday would be one for the store cupboard. At the weekend I heard my Scottish pals were planning some tri training. The weather forecast was excellent, I’ve finished a big project at work and I still have plenty of holiday time to take. So I asked, and I got an indulgent Wednesday off. Yippee! Ridiculously excited, I woke before the alarm clock. My bags were already packed with a selection of training gear, so I downed my porridge, loaded up my bike and hit the road. Shades on, Beach Boys on the radio, heading north into the sunshine along beside the bright blue sea. I rocked up, first to arrive and began demolishing the stockpile of jaffa-cakes (well breakfast was over two hours gone by then), talking ten to the dozen with Lesley, making a fuss of Jed and Finn and waiting for Al and Ann to arrive. It was great to be able to give Ann a massive hug and tell her in person how proud and inspired I was by her amazing run in the London marathon (finish time 3:09:00). And there were big hugs for Scotty too, dressed for the summer sunshine. A scramble for swimming kit, and off to the pool with Lesley’s son Al. I’d had a weird kind of nervous swim at tri club on Saturday, so I wanted to get a decent session in. It really is a lovely pool, so bright and until we got there, very quiet. I decided to take advantage of swimming in a 25m pool and get a 750m set in. A few warm up lengths and I was feeling the effort in my latissmus dorsi. A reminder that I’d done a tough weights session on Monday night. But I warmed up, slowed my stroke down and made my way through 30 lengths. After that I was pretty beat, but still had time to learn how to swim around a buoy with a backstroke turn. 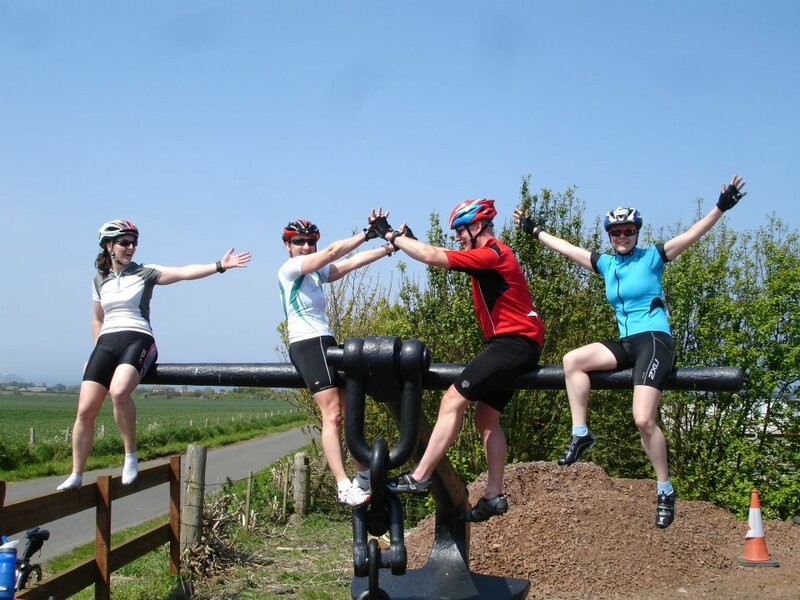 Then it was back to change into shorts and T-shirts and pose for photos with the dogs, ready for our bike ride. But not before I’d nearly come a cropper, sliding down the stone steps on my cleats. I thought for a moment I might have bumped my back, but I landed on my well padded behind and was none the worse for my muppet moment. A scoot onto the bike and off down the country roads, skimming by yellow fields, dashing through dappled sunlight on tree lined lanes. Pushing up a steep hill and feeling much more confident about dropping down the gears. Finding my place at the back of the pack, but just happy to be staying in range of cyclists with far more miles in their legs. Catching and talking to Lesley and Ann at times on the ride. Realising I’m keeping up the pace and it’s not too hard. Ann planting some inspirational thoughts in my head as I realise our thought processes about races and goals are really very similar even if her turn of speed seems supersonic to me. And loving the sound effects as we drop and float down hill, faster than I’ve ever been on my road bike. A couple of sprints and a big silly grin on my face, cycling in the sunshine, powering through the pedals. Then I fall back for a while and emerge at a junction to see Ann down in the middle of the road laughing. A bit of a scrape, but no big harm done. I’m not content with my pre-ride cleat slide and suffer a similar moment of unclipping left and falling right at another junction. Though it has to be said, my fall is not quite so dramatic as Ann’s. But like her, I’ve cramped the top of my right calf as I’ve stuck to a pedal. And my bike has another scrape. Sorry, Alice, but you knew the score when we got together. Adventures with me scratch the surfaces and get deep under your skin. Thankfully we avoid any more muppet moments, even as we climb aboard a 6 foot anchor for more silly photos. Cautious of my twingy calf, I drop down the gears and spin towards the back of the pack. My usual rides are around 20-25k and this will be more like 30, but it’s never felt less like training and more like fun. Another transition scramble into trainers and we’re off away up the road for a run. Al at first beside me could probably walk faster than the pace I’m managing with little steps, nursing a twitchy leg up the slight incline. Lesley encourages him to join speedy Ann and they soon kick up their heels ahead. I struggle to find my feet with the little steps that ease off the bike aches. When we turn off road through the fields I even walk a little. It is a glorious, hot day and the green shoots refresh my legs even as I struggle to keep them moving. It’s been a long time since breakfast. I pick up the run again and catch up as we scoot down hill through the grass. A couple more walking breaks, but I do keep on moving and even find my legs for a while back on the road again. We inhale the usual delicious spread of soup, bread, spreads and cakes, talking ten to the dozen, laughing, sharing stories, plans and thinking of other friends we’d love to have with us today. The day is passing in a blur. Scotty has to go and I know I have a drive ahead of me, so freshen up with a quick shower before I too hit the road for a sunlit drive home. I don’t think I’ve ever managed so much training in one day. 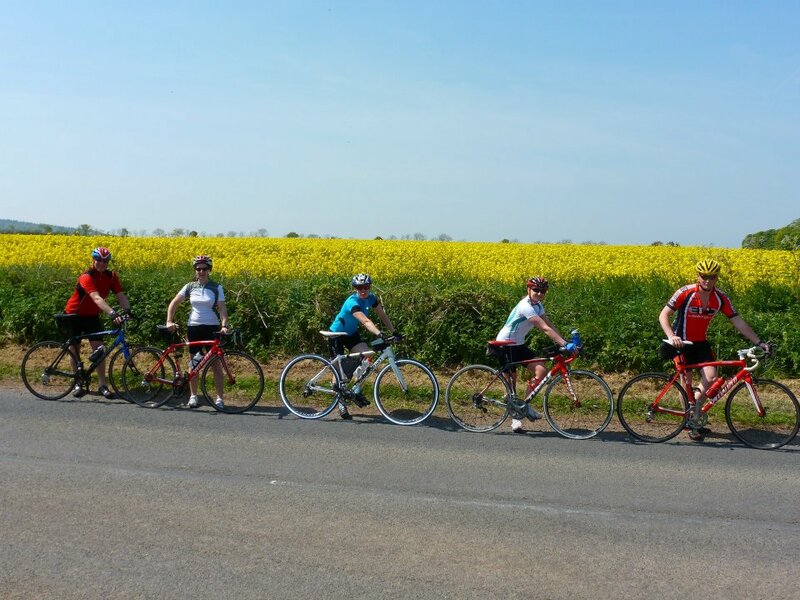 But how can you call a day in the sunshine, enjoying adventures with friends training? It was just fantastic fun and I thank the lifestyle that I’ve grown into that allows me to do all that. I have been longing to blog this fabulous day. But the truth is that I don’t have to pin it down in words to hold it in my mind forever. I have always loved my tri days with my Scottish pals, but that really was a jewel of a day. I drove home, happy and fulfilled, full of joy and confidence. Thankful once again of the steps and pathways that have brought me to where I am right now. Of the catalyst that got me running, of the mad ideas placed in my head that become reality, of the challenges taken and achieved. It got me thinking about other days in my store cupboard. There’s the big jar at the back that holds the moon over the ocean on the night before my wedding. There’s a voice I know as well as my own, singing my name. There are crowds, and high fives, and sweat and rain and orange segments and red and white streamers in the sky. And in the past four years there are many new friends. People I would never have met if I hadn’t started running. People who have been part of moments I treasure. People I consider my best friends. People I hope will always be in my life now. I could certainly learn something from the four time world champion, ironman triathlete. I took a trip to my work’s offices near Oxford this week, which gave me plenty of time on the train on the way back to finish Chrissie’s book ‘A Life Without Limits‘. Out of all the sports autobiographies I’ve read, this is the one I identified with the most. Maybe it’s because of her nickname, ‘Muppet’ because of her ability to get into scrapes. Maybe it’s her honesty and down to earth-ness. Or maybe it’s just the sport she’s chosen to make part of her life. Thankfully I don’t have personal experience of the issues with food and diet that she talks about honestly, but it did help me understand them a lot better. And I’d never survive her training regime or put up with half the things she did when turning professional. But I could learn a lot from her chapter on mental training, something I think she covers far better than anyone else I’ve read. On of her bits of advice is to have a mantra. I’ve had several now and use them in different ways in different races. ‘Don’t think, just run,’ is rapidly turning into ‘Don’t think, just swim’ as that’s another area where my brain tends to cause me more problems than my body. It’s been a pretty good week of training for me and a bit of a build up as I approach my first open water triathlon. Tuesday evening, I ran 10k mixing up my pace a little with some long intervals. 10k is a long run for me at the moment and it was good to feel I had some pace to offer. Even better not to feel any pain in my foot afterwards. I’m pretty confident that injury’s behind me. But I’ll keep on using the good habits I’ve learned during my recovery and hope to prevent it coming back. Wednesday and Thursday was business as usual with a boxercise class and then a PT session early on Thursday morning using the kettlebells as I’d missed my usual weights workout. I wasn’t sure whether or not to do parkrun on Saturday morning, after a tough run on Friday morning, but I figured it would be nice to catch up with some of the parkrun crew. It really is a supportive and friendly community on the town moor and there were some inspirational stories out there. I loved hearing Diane talking about her club Tyne Bridge Harriers and how much they are helping her. You could just hear the enthusiasm and pride in her voice. I topped off Saturday with a return to the tri club swim. I haven’t been able to go for a few weeks and strangely I was more nervous getting in the pool for that session than I was getting in the lake for my first open water swim. My breathing was a bit messed up and I was having a hard time settling into the swim. But the coach took pity on me and the other guy in the ‘slow’ lane and gave us some simple 200 and 100 sets to do with the pull buoy and after a couple of sets I started to relax and swim more controlled. I actually took the lead on the second of the main sets and found it easier to keep going on the longer sets. I was glad I kept going and shook myself out of feeling uncomfortable at the start. Each time I get a little nervous and anxious in the water, it gets easier to deal with. There’s still no conscious logic or reasoning behind it. It just happens and I deal with it. I think Chrissie might just do the same. Thursday dawned grey and drizzly after a night where the rain was bouncing off the roof. I was up early as usual for my PT session on the beach, where it felt more like November than May in the fine rain that gets you really wet without you really noticing. I’ve missed training with Ian the past couple of weeks while he was on holiday, so it was good to catch up, to pick his brains over training plans and to have him put me through my paces. I struggled a bit at first, soon out of breath, but gradually fell back into the rhythm and enjoyed a great workout. I carried a good portion of the beach back home with me on my sodden waterproof and trainers and left a good sprinkling in the shower. It felt good to be back. The work day whizzed by on a training course, my mind engaged in learning and working. 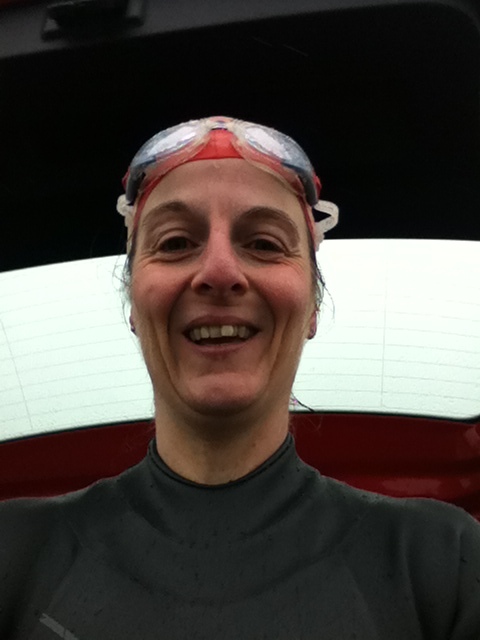 But the grey never lifted and I splashed through puddles as I drove up to the lake at Ashington for my first open water swim. Heavy traffic meant I was late to arrive. People were already wetsuited up as I ran over to meet up with the crew from the try a tri sessions. I quickly scrambled back to the car and into my wetsuit, checked in and approached the water with the group. I’d had no time to prepare myself, no time to think about it, I was just going in. A slippery couple of steps down into the water and it didn’t feel as cold as I’d feared on my feet. I sat down, to stop myself slipping and that encouraged me to get into the water and immersed quickly. The group began to swim out into the green waters of the lake, sighting using a pylon as swimmers placed buoys in a triangle. I bobbed along, old lady breast stroke style while I calmed my nerves. Swimming in the lake was fine. I knew I could keep myself afloat, and I wasn’t shivering. I enjoyed the feeling of buoyancy in my wet suit. But as soon as I put my face in the water to try and swim front crawl properly, I felt that old sense of panic and spluttered. I swam 2/3 of a circuit head out of the water, just staying out of everyone’s way. I tried again on the length back towards the shore, managing 3 or 4 strokes, but holding my breath and feeling my heart rate rushing. Back in the shallows, I found a place to stand and rest and get my breathing back to normal. ‘Oh well,’ I thought. ‘Looks like I’ll be doing breast stroke in my tri then’. But as I stopped, I realised it wasn’t the swimming itself I was worried about, it was just the old head in the water thing again. It wasn’t even the coldness on my face, just the unnaturalness of breathing out under water. And I’ve conquered that in the pool. I could conquer it again. So I set out on another lap and kept asking myself to try to swim properly. I managed 6 strokes, then 12, broke it up with a bit of random bobbing around and eventually managed to swim between two bouys in a combination of head down and head up front crawl. When I swam properly, I could feel myself moving more quickly through the water. I just needed to slow down the stroke and give myself chance to breathe. I have no idea how long I was in the water for. I’d guess around 15-20 minutes. There was still a group out with one of the coaches, but I’d had enough and made my way out. A lot of faffing getting out of my wetsuit and into dry clothes and my feet were freezing! Mostly I’d enjoyed my open water experience. There was a sense of freedom and exhilaration about swimming in the lake and I’d happily have bobbed around for a while. Properly swimming was a little scary at first, but I managed to get over that, so next time, I’ll have that knowledge to help me. I’m quite daunted at the thought of swimming 750m, and then getting out and onto a bike, following that with a run. But I will just tackle it like I did that first triathlon and throw myself into it when it comes. I’m encouraged by the way I felt when I was swimming and the fact I got in the lake on a cold grey day. I shall be hoping for sunshine on 3 June. My right shoulder blade was rather stiff afterwards, most likely a result of the cold and my head up swim technique. But a heat patch, some ibuprofen and avoid sleep just about sorted that out. I’ve come a long way since my swimming lessons and that first 100m front crawl. Open water is just another step forwards. So this is the race that kind of snuck up on me. I’d been so focused on getting my foot fixed (seems to be doing fine) and then thinking ahead to my big challenge open water swim tri, that it was here before I knew it. And yes, feeling slightly nauseous, hand shaking as I was putting the toothpaste on the brush this morning were the signs I was quite nervous about it. Struggling to finish my porridge was another one. Still I was all sorted, gear packed and off in the car in plenty of time. I just tried to keep quiet, took some deep breaths as I was driving and think about the race ahead. I’d read through my visualisation that had helped me overcome my nervous adrenaline rush in previous races and a chapter of Chrissie Wellington’s book for good luck before I went to sleep last night. And everything just about went how I imagined it would. It was nice to get a good luck text from Lesley just as I was setting off. 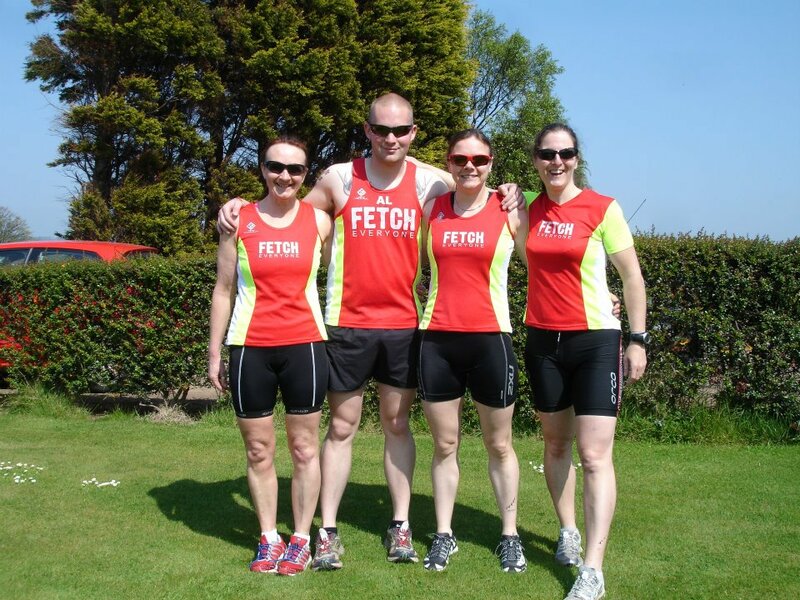 Last year, this race was my first ever tri and there were lots of Fetchies and friends doing it with me. This year I wasn’t sure who I would see. I’d got set up in transition and made the race briefing. The weather forecast wasn’t so good, with heavy rain predicted at some time, so I was a bit undecided about what to leave out. But the sun was out, and even though it was cold, I decided less stuff was less faff and I’d Geordie up and get on with it. I pretty much kept to myself, to avoid getting hyped up before the race. Did a little run, and stretches for a warm up, then ditched my hoody and shoes and made my way over to the pool. Had a nice chat poolside with a guy getting ready to compete in my wave and watched those ahead of us in the water. As we got ready to go, I took some more deep slow breaths. I was first off in my lane. I managed a quick sink to blow bubbles – nice and smooth and controlled – and then I was off. The water was really warm, which I didn’t much like, but I just tried to keep it slow and easy and give myself time to breathe. I’m afraid my other swim techniques such as getting my head low and my elbows high either happened or didn’t happen, as I wasn’t thinking about them, just concentrating on breathing and feeling relieved that I’d managed not to panic and swim like a brick. I was pleased to be first as I knew I’d have clear water ahead of me, but within a couple of lengths I was tapped on the toes and overtaken twice, once by a guy and once by a girl. I pulled over to let them past and then tried to get a pull off their swim on the way back. They didn’t hold me up for long. A couple of times, I misjudged the breathing and swam a few strokes with my head out of the water, and I took my time to gasp a good breath or two in on the turns, but mostly I felt nicely in control. I reckon there’s a lot more in my swim if I can get used to pushing myself a bit. For today, I was just happy to do it without feeling the adrenaline fuelled anxiety. About 10 lengths in, the guy in front of me stopped at the side of the pool, saying, “I’m going to do breast stroke,” so I got one of my places back. With 2 to go, I really turned on my kick, powered up and down the pool and then out and off into transition. A bit of a run down the path to the car park and to see my lovely bike all bright and shiny, racked up and ready to go. Helmet on and I grabbed a piece of mango I’d stuck to the stem. Struggled a bit with my bike shoes, but got them on, unracked the bike and off out to the mount line. Thoughts of disqualification popped into my head, but I knew this was a friendly event, and so I resolved just to keep going and make the best of it. As I passed the marshalls at the key points I yelled out my number to them. One even said, “It’s on your helmet – you’re alright’, which was something of a relief. Bet you I don’t do that again! The bike route at Ashington is two and a bit laps. Out up a main road to a roundabout, then left through some country lanes, then down towards a little village, with a sharp left hand turn and then a steep climb up, with a twist in the middle, so you think you’ve got to the top and there’s a bit more. 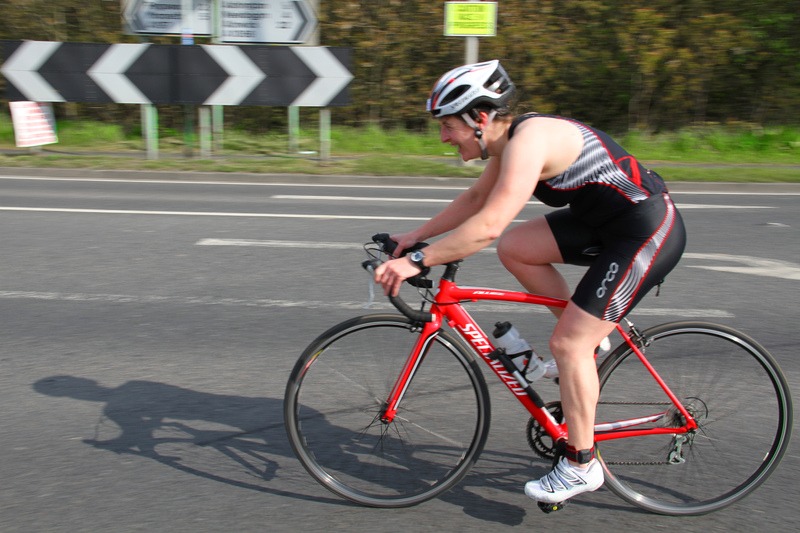 On my first lap, I’d been overtaken by quite a few bikes, which I was expecting. With it being a lapped course, you’re never quite sure what lap everyone else is on and there were some fast bikes – lots of tri bars, carbon frames and disc wheels. But as we came to the hill, a guy came past me and then seemed to just putter out on the climb. I was in my lowest gear and towards the middle of the road, which I knew was slightly less steep, so I managed to overtake him on the up and get closer to the girl in front of him. My breath was coming fit to burst when I reached the top and while I recovered, the guy on a nice Ribble (so I suspect carbon frame) got his place back. “Second lap?” he asked as he sped away. “No, first,” I managed to breathe out. Breath recovered, it was back on the power and up through the gears and soon round for another go, just taking care at the junction onto the main road. This time I rode all of it on the big ring, putting the power on and dropping a few cogs for the small rise towards the roundabout. Back round and flying down the down hill in top gear, dropped and tucked, then peeling off the pace for the turn and a quick drop through the gears for the climb. No one to pass this time. Just make it to the top. And boy did it hurt! However did I manage this on a mountain bike last year? Oh yes, I was fitter and lighter then. Another slow down recovery at the top, then on for the final section, with the relief of knowing I didn’t have to tackle the hill again. Just up to the roundabout and back down the road. I remembered the back down as being all downhill, and I flew dropped and tucked for a while, but there were a couple of slight gradients and with the wind in my face, I was feeling the effort, but the end was approaching. I’d dried out pretty well in the wind, but my feet were freezing. I tried to curl my toes in my shoes to get the circulation going, but couldn’t feel anything. Back round by the shops and roundabouts and heading into transition. The marshalls were waving a car through as I approached, but he didn’t go. I’d slowed down, being wary, but managed to get around him and thank the marshalls as I headed back into transition. A moving dismount this time and crunch, my feet hit the tarmac and I kept on running with my bike. Round and racked. Bike shoes off, road shoes on. Helmet balanced on the bars and go! Ow! Ow! My feet protested. Little steps, little steps, just keep moving I told myself as I stumbled out of transition and onto the pathways. It’s a 3 lap run route, so I’d mentally given myself a lap to warm my legs through and get the muscles used to moving for the run, rather than the bike. But my feet were frozen. Running off the bike is always a bit weird, and usually reminds me to pay attention to my calf muscles, and knowing it does ease off is the only way to get through it. But this was like nothing I’ve felt before. My feet felt like theywere running between cold iron rails. Like they were being crushed at the sides and hitting something hard beneath. I actually looked down at my shoes to check I hadn’t picked up the wrong ones. Mind over matter, I kept moving, telling myself it would pass, that my feet would warm up. But all the time I felt like I was barely jogging along. Aerobically, my breathing was easy, my legs just wouldn’t go fast enough to make me breathe any harder. “Relax and enjoy” – I tried Scotty’s mantra. My running is a long way away from where it was this time last year, so I wasn’t going to make any unreasonable demands of my legs today. Just drop the shoulders and try to pick the knees up. As I came round to the end of the first lap, I saw Stuart just ahead and he gave me a shout. “You’ll catch me,” he said. “You’re kidding,” I replied, thinking not with my feet feeling like this. It was 3/4 of the way around the second lap before my right foot began to feel anything like normal and my left was still stiff and cold. I’m sure my form was appalling. Once again, towards the end of the second lap I saw Stuart and I’d gained a few yards on him. So I held him in my sights for the last lap and whether it was having a target to aim for, or just finally thawing out, but at last I started to feel like I was properly running and I caught and passed to some friendly encouragement about half way round. Onto the final pass of the playing fields and in my mind I’d determined to pick up the pace here, but it was really hard going. I think the wind had picked up a little and my leg muscles were still fighting any turn of pace. So, in the end I left it all to one of my death or glory finishes. Onto the grass, with the finish arch in sight, power through the arms and a sprint that came out of nowhere. Heard my name being called as I crossed the line. Brilliant! A lovely lady marshall came over and asked if I was okay, and took my chip off for me. I was fine after gulping a couple of mouthfuls of air. High as a kite for completing my first race of the season and just happy to be back and racing. I saw Stuart come in just after me (although way ahead on the timings as he was in the swim wave after mine), grabbed a cup of water and an orange segment, then went to get my race times. It’s not a course best, but I really lost time on the run and probably could have pushed a bit harder on the bike. But all said and done, it’s my first race back and it went better than I expected. What’s even more wonderful is that my tri inspiration Lesley raced yesterday and completed her race a minute faster than me and she did a longer swim! Just shows what you can do with focused training and skill. It was fabulous to get a call from her at the end of my race and compare notes. So, I am about where I thought I was. My swimming is better. The time’s not a big improvement, but the strength and energy I had to spare on that shows I can push harder here. Time to forget I ever had a ‘moment’ or two in the pool. I beat that last season, so now it’s time to get sharp and swim hard. The run could be better. I know that. It’s just where I am right now. I’m coming back from injury and I’ve lost some of TheScribbler pace. But I’ve got experience and stamina and the pace will come back. This has really made me realise what an absolutely amazing running year I had last year. I was on form and fast. But I was very running focused and a bit lighter then. I don’t want to lose my tri focus right now, so I shall just let my running come back to me in its own time. And another run with no sign of the plantar fasciitis is a brilliant result. Just remind me how hard that slightly less than 5k was after a bike ride and how I’d have to do all that twice next time I mention a standard tri. Must train harder! My PT and good friend, Ian, really knew what he was doing when he first put the idea of a triathlon in my mind. It fits so well with my ideas about whole body fitness, training variety, strength, focus and most of all fun. Still such an adrenaline rush! So, first one down and more to come. Bring it on! Larkin’s poem struck me as absolutely perfect today. And it reminded me of something I wrote, inspired by my travels to Japan where I saw the spring cherry blossom or sakura. The ancient are still young at heart. Within each day is a lifetime.